Why are the New Ghostbusters suddenly embracing the Old Ghostbusters, especially after going to such lengths to create some necessary distance? In case you missed the story over the weekend, Old Ghostbuster (or "O.G.") Bill Murray was spotted in Boston reportedly heading to the set of Paul Feig’s Ghostbusters reboot, where he was expected to film a cameo. This news arrived on the heels of the surprise announcement that similar "O.G." Dan Aykroyd will pop up in next summer’s reboot (remake? reinvention? continuation? ), playing a cab driver who may or may not use the line "I ain’t afraid of no ghosts" in conversation. These strike me as awkward decisions… or, at the least, reversals of intention for a movie that had done everything in its power to separate itself from the looming shadow of the famous Ghostbusters and stand on its own two feet. And from our perspective, Feig and his ladies were succeeding. The director captivated a new audience with looks at the proton packs his female cast would wear. He teased us with the Ecto-1 that they would drive. And finally, he seemed to put a lot of fears to rest with this winning, casual and calculatedly disheveled cast shot of his four female Ghostbusters: Leslie Jones, Melissa McCarthy, Kristen Wiig and Kate McKinnon. To paraphrase the first movie, we’re ready to believe in what Feig and his ladies are creating. So why are they, all of a sudden, inviting comparisons to the movies that came before them? 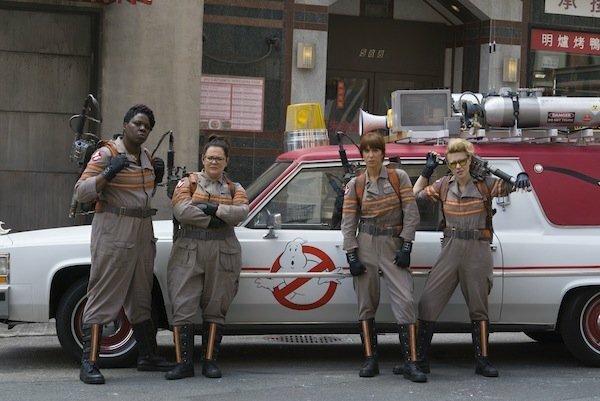 Doesn’t Paul Feig realize that the presence of Murray and Aykroyd will only create distractions that will prevent the hysterical ladies from establishing their own interpretation of the ghostbusting team? Imagine a Beverly Hills Cop remake that cast Eddie Murphy as a deli counter clerk. Or a Ferris Bueller’s Day Off reboot that cast Matthew Broderick in the role of the snooty restaurant maitre d. The presence of these actors, in projects based on their iconic roles, would instantly take you out of whatever world was trying to be constructed. Bill Murray and Dan Aykroyd certainly had their chances. There were numerous times during a lengthy jaunt through pre-production where the next Ghostbusters film actually would have been a third movie with the original cast… only, Murray never really seemed interested. When Harold Ramis died, the project seemingly disappeared with him, and Sony was able to shift gears to this new interpretation of the classic story. Paul Feig was hired, the four ladies were cast, and the project was well on its way toward establishing its independence as a singular comedic entity – or even a launch pad for more original Ghostbusters creations. And from that point forward, any connections to the old Ghostbusters series should have been severed... at least until this movie was able to do its own thing. Including Bill Murray and Dan Aykroyd on this new Ghostbusters, in roles that aren’t Peter Venkman and Ray Stantz, seems to be a step toward appeasing the vocal minority who opposed any sequel/reboot that didn’t include the "O.G." actors. Except, now that we know Murray and Aykroyd are part of next year’s comedy, won’t too many of us just spend our time waiting for them to surface? How many people, next summer, will shift the conversation to the use of Murray and Akyroyd, rather than discussing how McCarthy, Wiig, McKinnon and Jones did? It’s possible that this is an overreaction. Murray and Aykroyd’s roles might be miniscule, and the chemistry displayed by the new team easily could overpower what amount to cute cameos. Paul Feig’s Ghostbusters might end up being a funny and scary standalone film, and no one will compare the success of the 2016 film to the accomplishments of the original. But at the moment, Murray and Aykroyd feel like the elephants in a freshly painted room, and I for one am really puzzled as to why Feig would invite these recognizable guests to his party.